This is one of my oldest, most beloved and often cooked spring/ summer recipes. It’s been with me for so many years and I still savour it as I did the first time I cooked it. 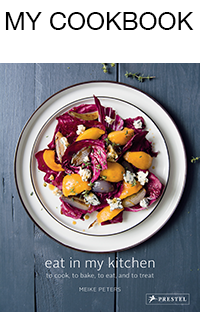 It works both warm as a comfy pasta dinner with a glass of rosé wine, the windows wide open and the flowery smell of June in the air but also as a cold, summery picnic salad, enjoyed outside in the fields under the rustling leaves of a swaying tree. 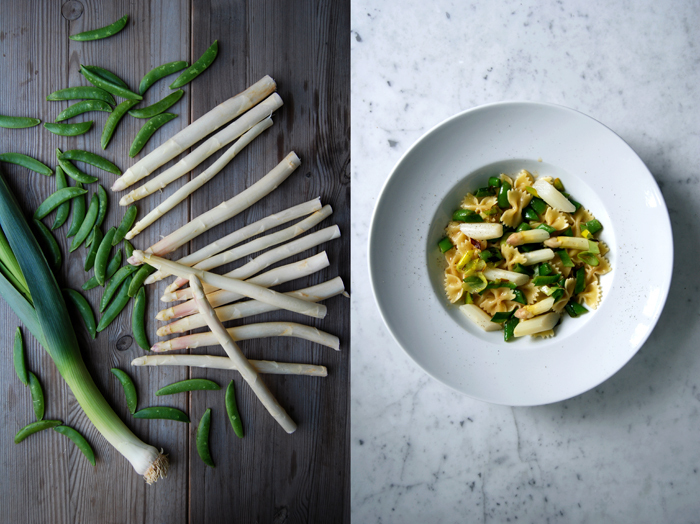 I’m talking about the wonderful combination of the fine flavours of white asparagus together with sweet peas in their crunchy pods, leek and a light sauce made with spicy Dijon mustard. All this on top of a big bowl of pretty Farfalle pasta, little bow-ties of perfect size and shape to catch all these nice vegetables like a shovel! This meal tastes fresh and light and is absolutely easy to prepare. 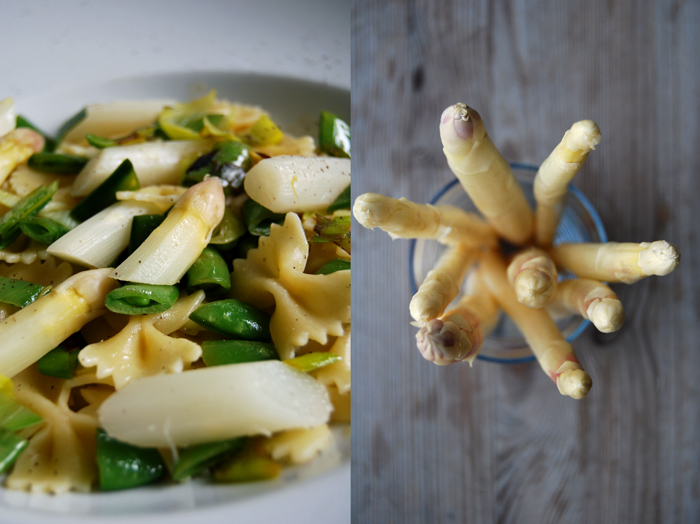 You just need to cook the asparagus (green or white), sautée the young pea pods and leek (you could also blanch some peas), deglaze them with white wine or vermouth and mix everything together with the cooked pasta, some mustard and cooking liquid, salt and pepper – that’s it! Cook the pasta al dente in lots of salted water. 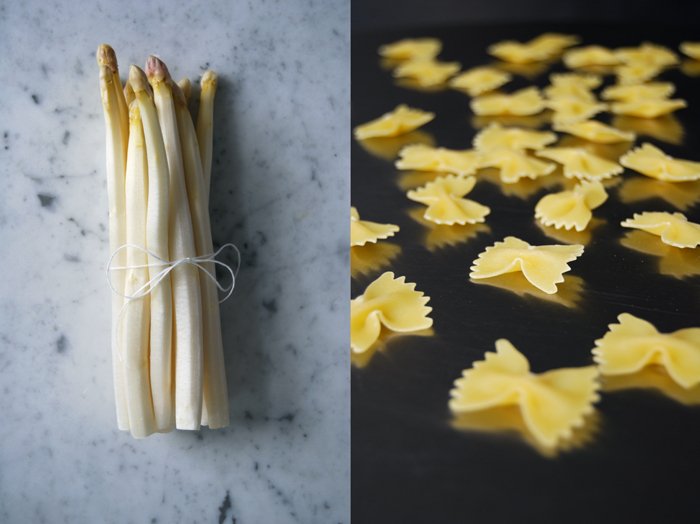 Cook the asparagus al dente in lots of salted water with a pinch of sugar and cut into bite sized pieces. In a large heavy pan, heat a splash of olive oil and fry the leek for a few minutes until soft and golden, add the pea pods and fry for another 1-2 minutes. 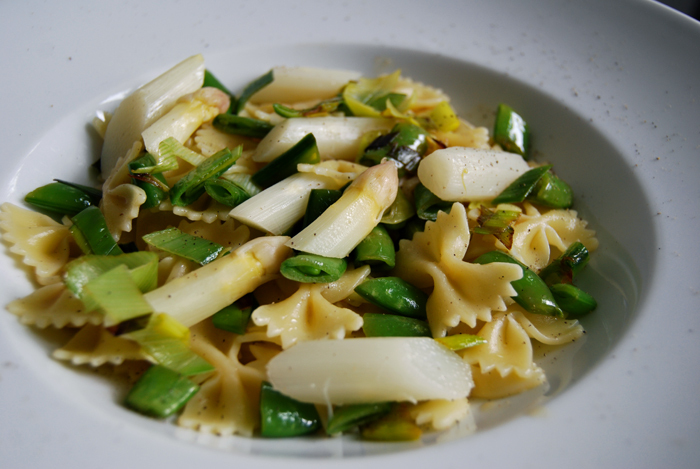 Deglaze with a splash of wine, add the pasta, mustard and water used to cook the asparagus. 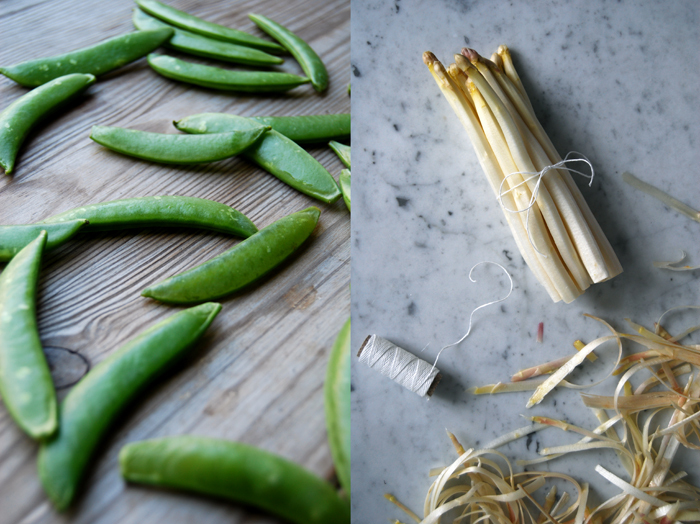 Season with salt and pepper, add the cooked asparagus, mix and serve on big plates. I’d never thought of a good way to use mustard with pasta but can imagine how these flavours would work beautifully. I’ve just saved a handful of your recipes having just discovered you-I’ll give you a special mention of course if I feature any. Thank you, great blog!!!! Thank you Katie! I’m glad you enjoy the blog! I love to use mustard for my pasta recipes, I have another one with radicchio and chicken liver, that’s great too. It’s a hearty Italian winter dish! 🙂 It’s an absolutely delicious combination! !